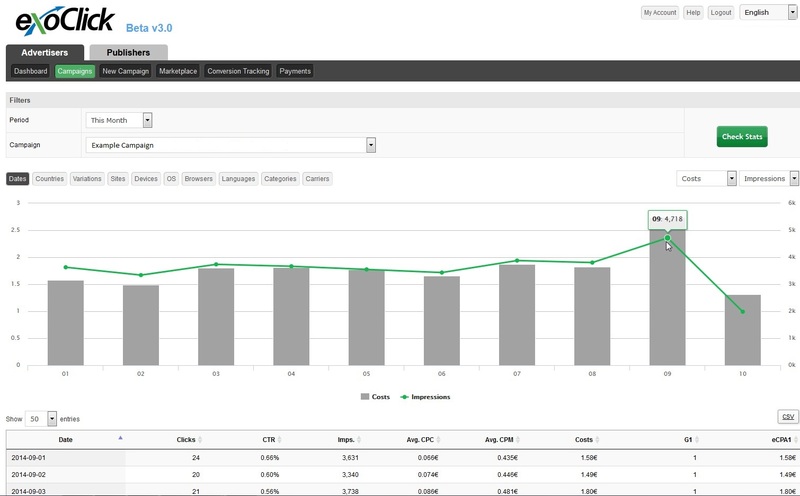 ExoClick has launched Version 3 of its Admin Panel and it comes with a host of improvements that give both Publishers and Advertisers access to Big Data statistics. Welcome to Part 1 in our series of tips that will show you how to use the new features in our Version 3 Admin Panel. In this blog post we will be explaining what exactly Big Data is, how fast our statistics are, how you can use the new ‘time’ related data filters to help you evaluate and understand campaign performances better and how to set up timed campaigns using the new Day Parting function. How is Big Data going to help me? Put simply Big Data is a log of every single click a person makes on an internet connected device: desktop, mobile, tablet, smart watch, gaming console, Smart TV, etc. So with an estimated 2.2 million terabytes of new data being created everyday the key to exploiting this data is to create filtering tools that enable marketeers to analyse this data in a useful form, so that they can make informed decisions on where and how to spend their advertising budgets. So with all this data being collected every second, it is imperative that marketeers get access to this data in real time. 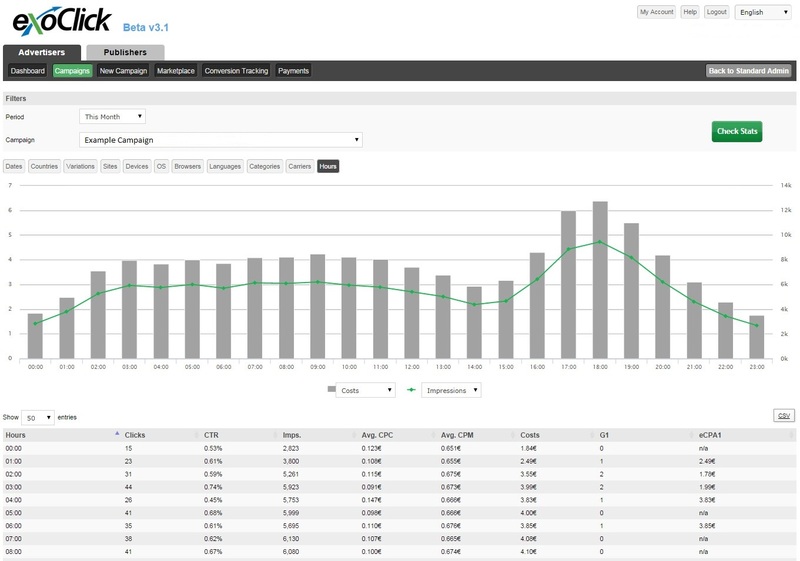 The improvements with Version 3 allow for near real time analysis with data being updated and refreshed every 60 seconds. So why is this so important? Because of this accuracy it allows you to switch the focus of your campaigns instantaneously by reacting to up-to-the-minute data results in the digital market place. Version 3 comes with a varied selection of filtering tools so that many different segments of your campaigns can be analysed and evaluated. There are two sets of filter tools that you can use to carry out an analysis utilising the big data you created by your campaign. So now you have selected the parameters you can now choose one of the following filters to display your campaign results: Dates, Countries, Variations, Sites, Devices, OS, Browsers, Languages, Categories, Carriers and Hours. For this blog post we are looking at two specific time related filters: Dates & Hours. This filter shows statistics generated each day during the time period you set and they are displayed in a bar graph form. Here you can see your daily statistics including clicks, CTR, impressions, CPC, CPM, CPA, conversions and cost per conversion. This filter gives you even more time related details so you can see what is happening hour by hour on the dates you select. The update also includes a feature for selecting the exact times of when you want your campaigns to run, it’s called Day Parting. Simply set up your RON campaign as you would do normally, then click on the Advanced Settings tab and select Ad Schedule. Now you can choose the times and dates you want to pre schedule your campaign to run. On the right hand side there is also a pull down menu where you can select the time zone of the hours you have selected. Experiment with these tools to learn more about your target audiences conversion times and fine tune your campaigns accordingly. In Part 2 we will look in more detail at the other sub filters now available: Countries, Variations, Sites, Devices, OS, Browsers, Languages, Categories and Carriers and how you can eliminate unprofitable elements to increase your ROI.